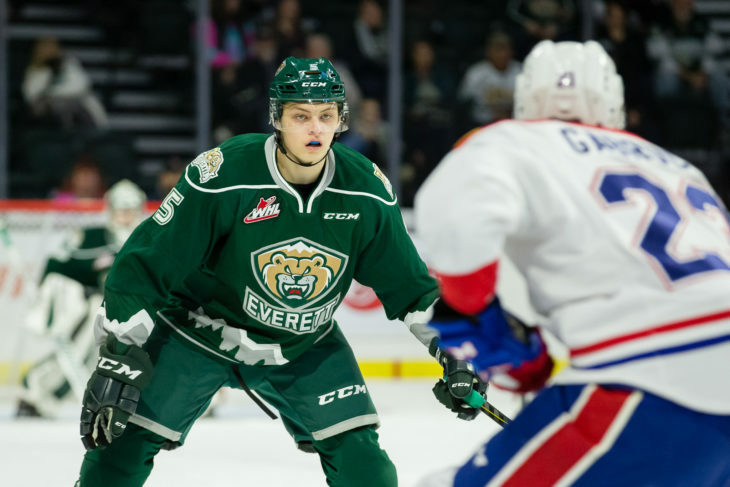 In our second of four 2019 WHL Playoffs second round previews, we examine the Everett Silvertips and Spokane Chiefs. 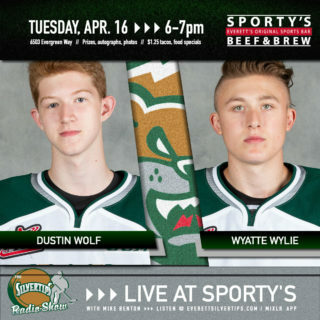 For the Everett Silvertips and Spokane Chiefs, their matchup in the second round of the 2019 WHL Playoffs will be the concluding chapter of their heated U.S. Division story. After battling it out during the 2018-19 WHL Regular Season for first and second place in the U.S. Division, the two teams will need to gear up for the final round, where only one team will emerge victorious. Last time the two teams faced off in post-season action was in the first round of the 2015 WHL Playoffs, where the Silvertips defeated the Chiefs in a 4-2 series. In their WHL history together, this was the third time Everett advanced over the Chiefs with Spokane’s only playoff series victory occurring in the 2008 WHL Playoffs, in the first round. Heading into the second round of playoffs, Everett leads Spokane with a record of 6-0-1-1, giving the Silvertips a clear home-ice advantage as well as strong winning statistics over the Chiefs. But, don’t discount Spokane just yet. Their compete level is among the highest in the league and they are well-known for pushing teams into overtime or even a shootout with just a few minutes remaining in the game. If the Chiefs are in the position of a tie, overtime or shootout, they will need to focus on their finish as that’s where Everett typically dominated in the regular season. With captain Connor Dewar (Minnesota Wild), Bryce Kindopp and Zack Andrusiak leading the offensive charge, the Silvertips don’t have any troubles scoring. 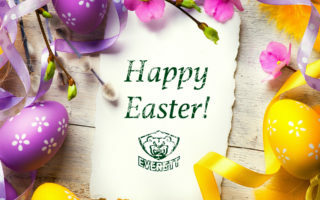 Martin Fasko-Rudas and Max Patterson also bolstered the Silvertips scoring chances in the first round of the 2019 WHL Playoffs. Add in strong goaltending by 2019 NHL Draft prospect Dustin Wolf and an albeit younger defensive core, the Silvertips are looking strong and fresh for the second round. Both of Spokane’s 2019 NHL Draft prospects Luke Toporowski and Adam Beckman performed well in the first round of playoffs, finishing with five points each. Combined with Riley Woods, co-captain Jaret Anderson-Dolan (Los Angeles Kings), rookie Jack Finley and Eli Zummack, the Chiefs’ offensive efforts were tough for Portland to beat. Strong additions on the blue line include co-captain Ty Smith (New Jersey Devils), Nolan Reid and Filip Kral (Toronto Maple Leafs) all of whom will be hungry to shut down Everett’s offense. (ICYMI) Round ✌️, here we come! First Place – U.S. Division Standing Second Place – U.S.
Defense. It’s already been proven that the Silvertips can score and that their leading goaltender Dustin Wolf can stand on his head, but where Everett really needs to focus is on their blueline. In the first round of their playoffs action, all of the Silvertips’ defencemen ended up with a positive ranking after five games. If they can continue to stay on the positive side as well as contribute a few points, the Silvertips will be in good shape defensively to advance over the Chiefs. Artyom Minulin on defense against the Spokane Chiefs. In regular season series against Everett, the Spokane Chiefs could easily spark a lead, but would just as quickly lose it by letting the Silvertips score multiple goals in a row; deflating the Chiefs. In six out of the eight games between each other, the Silvertips went on a two-goal scoring streak or more, preventing the Chiefs from picking up any momentum. In one of their two wins, Spokane managed to spread out Everett’s goals by scoring in-between, as to not let the game get out of hand and it worked in the Chiefs’ favour. While shutting down Everett’s offensive group completely may not be an option, Spokane needs to try their best to score their own goals and cut down the Silvertips’ goal streaks before it’s too late in the game to get back in. 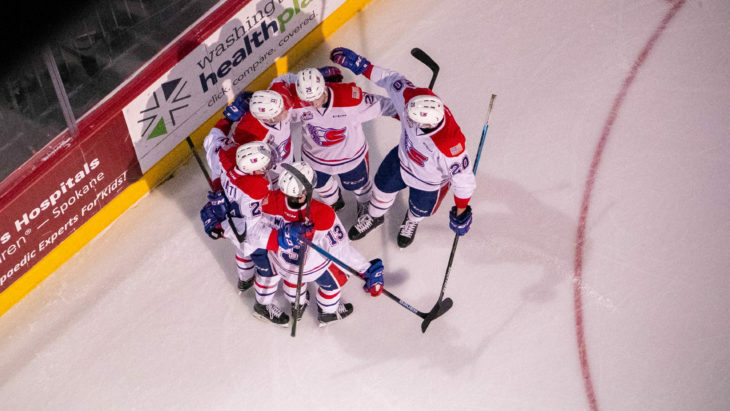 Spokane Chiefs celebrating a goal against the Everett Silvertips on March 5, 2019. 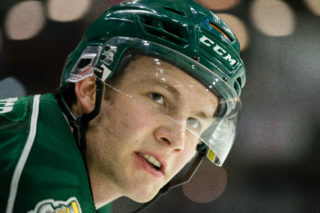 Bryce Kindopp (39-34 – 73): The 19-year-old has blown past his previous regular season and WHL Playoff records recording a career-high of 73 points with the Silvertips and nine points in the first round of WHL Playoffs. In the first round of playoffs, Kindopp landed in a tie for second place among all WHL skaters with five goals and four assists against the Americans. In their fifth and final game of the series, Kindopp scored his first playoff hat trick in a 9-1 win over Tri-City. With three WHL Playoff experiences under his belt, including a WHL Championship round from last year, Kindopp has the maturity and skills to guide his teammates through another round and will be a prominent figure in the games against Spokane. Adam Beckman (32-30 – 62): In his first season of the WHL, Adam Beckman has impressed. The recent Rookie of the Month for March 2019 capped off his regular season with two four-point performances and continued to aid his team in their success during the playoffs. Earning a point per game (3G-2A) in the five games against Portland in the first round, Beckman came in clutch for his team in pivotal moments. Pushing Portland to the edge of elimination, Beckman scored a fantastic overtime goal to take the series lead for Spokane 3-1. With a 44th-position ranking on the NHL Central Scouting Midterm Rankings, Beckman will look to push his limits to move up on the list before the NHL Draft in June and continue the Chiefs’ success in the post-season. Jake Christiansen (12-32 – 44): Jake Christiansen has been on fire for the first round of WHL playoffs and it doesn’t look like he’ll be slowing down any time soon. Half-way through the first round, Christiansen was awarded WHL Player of the Week after recording five points (1G-4A) in two playoffs games. With an additional assist in the last game of the series, the 19-year-old has established himself in the top five defencemen overall in WHL Playoff scoring. Christiansen has also competed with the Silvertips for their last three playoff runs, giving him a leadership position on the blueline and the bench. Nolan Reid (17-34 – 51): While Nolan Reid’s name may not be as well-known as Ty Smith’s, his contribution to the Chiefs and their blueline is just as impactful. Finishing the regular season with 51 points (17G-34A), Reid tied for eighth place among all WHL defencemen. He now also leads the Chiefs’ defencemen with four assists after the first round of playoffs. Reid will look to continue his work on the blueline and even fly under Everett’s radar, giving Reid the chance to step into the offensive zone and closer to the net. Dustin Wolf (61 GP, 41-15-2-2, 1.69 GAA, .936 SV%, 7 SO): Everyone knows Dustin Wolf is a good goaltender- no questions asked. With his league-leading record of 41 wins in the regular season, Wolf has provided the Silvertips the stability they needed to succeed this season and thus far, throughout the playoffs. After the first round of playoffs, Wolf leads all goaltenders with a 1.60 GAA and .937 SV% and was recently named the WHL ELI Wilson Goaltending Goaltender of the Week and league nominee for the sixth time this season. Bailey Brkin (45 GP, 27-11-1-2, 2.75 GAA, .914 SV%, 2 SO): When playing the Silvertips, you can always expect a high shot count – something the Chiefs’ starting goaltender Bailey Brkin should be fairly used to. With the exception of three games in their head-to-head series, Brkin faced 37-plus shots from the Silvertips and handled it well. His most impressive performance against the Silvertips came on December 12, 2018, with 43 saves and the final shootout win, 4-3. As the goaltender for seven of the eight games in the series, Brkin will be counted upon to stop Everett’s numerous shot count. 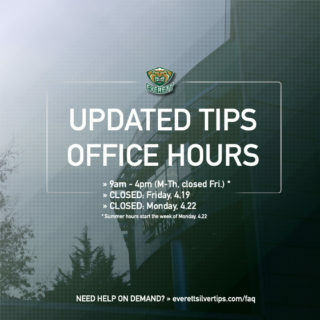 As 16-time WHL Playoff contenders, seven-time U.S. Division Champions and two-time Western Conference Champions the Silvertips’ franchise is well equipped to handle another round in the playoffs. 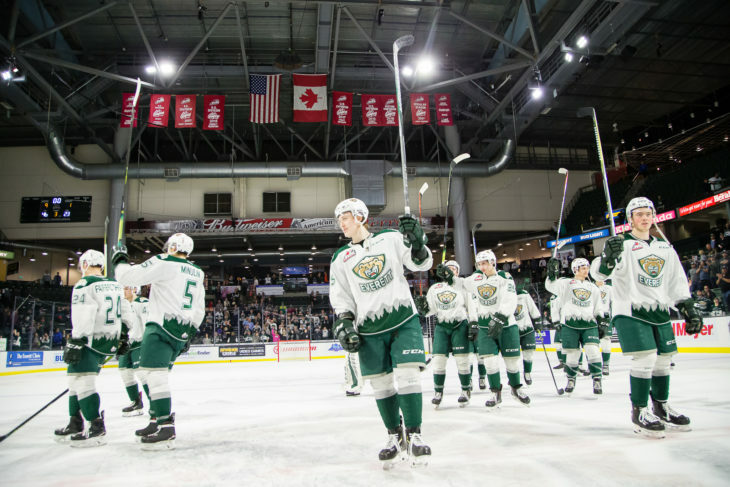 After coming oh so close to a WHL Championship in last year’s run, the Silvertips are hungry for redemption and will be looking to get through this series as quickly as they did the last. 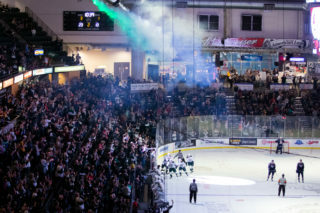 Silvertips thank their home crowd after winning their first round of the 2019 WHL Playoffs. The Chiefs aren’t far behind when it comes to franchise success. Where they fall short in U.S. Division titles compared to the Silvertips, Spokane makes up for it with two WHL Championships and Memorial Cups in both 1991 and 2008. This is the first time the two teams are meeting in the second round of the playoffs, maybe providing a clean slate for the Chiefs as they have previously lost to the Silvertips three time in the first round of playoffs (2015, 2007 and 2004).